In the early nineteenth century, microscopists were looking for more efficient ways to follow moving organisms under the microscope. Although the mechanical stage was already available, it usually had controls that moved in one direction or another but not in any arbitrary direction. Even Turrell's stage, with concentric controls, could not be easily used to follow an organism moving in quickly changing directions. Furthermore, because the view in the microscope is inverted and reversed right to left, moving the stage or specimen while looking under the microscope can be confusing and appears reversed from what the eye would expect; i.e. when moving the specimen to the right, it appears to be going to the left and vice versa. For these reasons, two different inventors came up with Lever Stages which made this easier. Since they operate on a fulcrum, moving the control in one direction, actually moves the specimen in the opposite direction, but matching the direction seen in the eyepiece; i.e. pushing forward on the 'joystick' seems to move the specimen forward in the field, which is actually reversed. Because they could move in any direction, they also allowed the user to follow the organism in whichever direction it was going. One of the first to report his design was Alfred White; he reported this in the Transactions of the Microscopical Society in 1844 and stated he had been using the design for three years when he wrote the article in 1843, in other words, since 1840. The movement of this stage was controlled from above it. The second type was invented by Cornelius Varley and controlled the stage from below. Although Varley's version was never used as a control above the stage, it is common to see the above-stage version called (erroneously) a Varley stage. As I believe credit should be given to the original inventor, I have always referred to the version controlled from above as a 'White Universal Lever stage.' The term 'Varley Stage' should only be used to refer to the stage controlled from below. Many microscopes have had lever stages, either as a stock item or an option,but the above-stage White Lever Type is much more common. 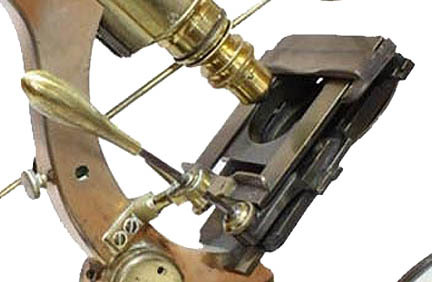 The example seen here to the left, and in more detail to the right, is a microscope made by James Smith which had its original mechanical stage later replaced with a White Universal Lever stage. It consists of a brass-handled shaft with a ball on its mid portion attached to the limb, with its distal end a ball and socket joint controlling the stage,which is movable in any direction through an arrangement of a dovetail plate moving from right to left, and a dovetail motion forward and backward. 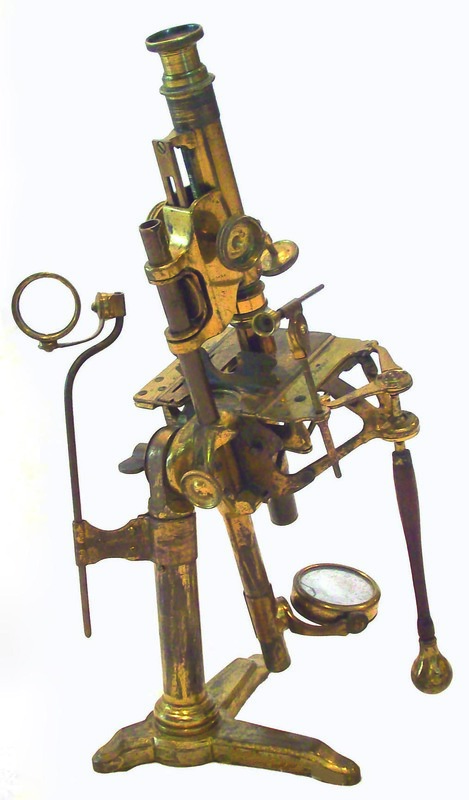 The original example of this stage attached to this Smith microscope was prone to wear and no longer functions well. This arrangement was beefed up in subsequent Smith & Beck Models which still do work well. A sterrup-controlled lever stage, controlled from under the stage (left), was devised by Cornelius Varley apparently in the 1820's. Some of his earliest illustrations of such a device were published in the Transactions of the Society of Arts in 1831. He subsequently developed a form controlled by a single lever(right), patented in 1841 and reported in the Transactions of the Society of Arts in 1843. 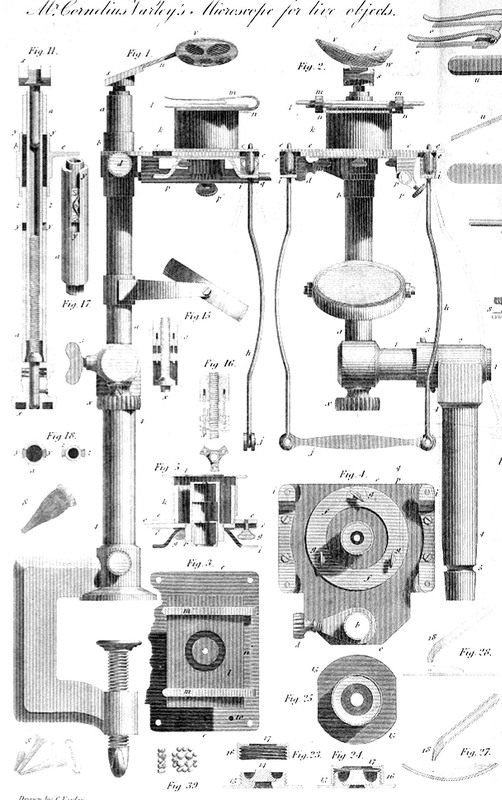 The example of a microscope with Varley's improved lever stage from the Frank Belinskey collection is shown to the right, and in more detail on its own page on this site. 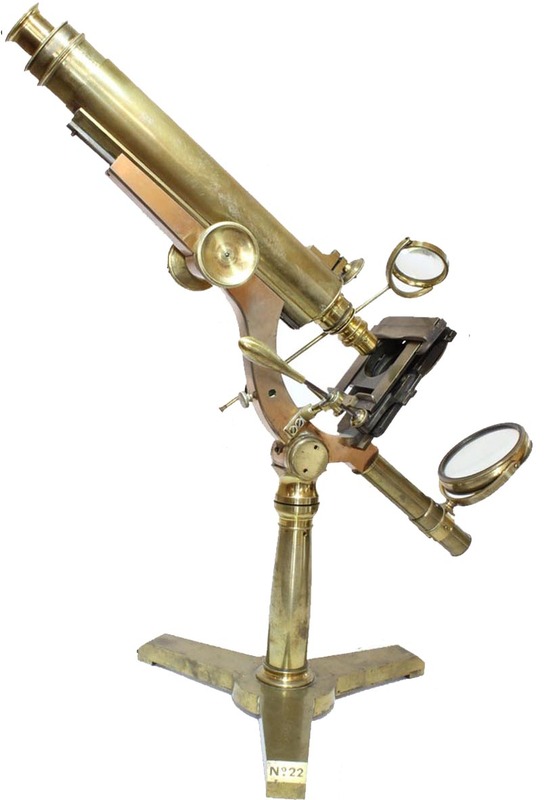 The author is grateful to Dr Beliniskey for allowing me to show his images of this most remarkable microscope. A later example of the use of Varley's improved under the stage lever control can be seen on Dr Jurriaan de Groot'sVarley Bar Limb Microscope; I am grateful to Dr de Groot for allowing me to use the images of that microscope on this site. In the late 19th century, French makers, particularly Mirand, came out with a simplified lever stage which actually lacked the advantages of the original types shown here. This control, as seen on the Mirand Microscope on this site, used a top stage plate fixed to the left side of the stage by a screw in a slot and moved on the right side by a lever. This device does not allow one to move easily in any direction, but rather front and backward movement can only be easily accomplished in an arc. In addition, because the fulcrum is actually at the top plate of the stage, it does not reverse the motion to match the appearance in the eyepiece. For these reasons, the French lever stage was never used with high class microscopes. The author would urge the reader to remember that Alfred White invented the above stage-controlled lever stage, and that Varley developed the under-stage model. Varley's name should not be associated with both. White, Alfred. On a Lever Movement to the Stage of the Microscope.Transactions of the Microscopical Society of London Vol I, 1844. pp165-166, and plate 20.